Add a hint of the sea to your garden using the BirdBrain Delmar Firepot. This shapely vessel will certainly delight all visitors to your yard. The wide, round body of the pot tapers inward near the top, leading to a slightly extended, black colored neck. The smaller base diameter of the pot creates a stable surface, enabling the unit to rest on your patio or table easily. Irregularly shaped pieces of green seashells adorn the exterior of the ceramic vessel, each with a slightly iridescent sheen. A clear glaze covers the entire piece, and the black neck finishes the effect. A stainless steel cup rests at the top of the pot, accommodating fuel gel (not included). This gel will burn cleanly, without smoke, ashes or soot, for an exciting and safe fire, and is easily refilled. Use the included metal snuffer to extinguish the flames when you are not in the area. The ceramic construction of the pot withstands use indoors or out, and the sheen on the shell pieces will easily react with the light of the fire. 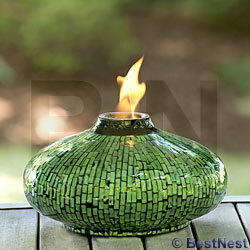 Combine elements of land and sea together in a dazzling way using this Delmar Firepot. Note: As the shell pieces are hand applied, individual items may vary.